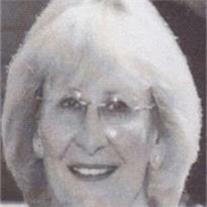 Carole Ann Lines Augustin, 75, died June 28, 2011 in Mesa, AZ. She was born Dec. 1, 1935 in Takoma Park, MD, and preceded in death by her parents Earl and Maxine Lines. A life long member of the Church of Jesus Christ of Latter-day Saints, she served in many callings. She is survived by her husband Fred J. Augustin, Jr.; 5 children Gary R. (Diane), Chris F. (Hilda), Laurie E. Milliron (Doug), Linda E. Louden (Mitchell S.) and Kurt J. (Jody); brothers Larry, Wayne, Alan, 28 grandchildren and 33 great-grandchildren. Carole was in the antique business with her husband and mother and was well known as an antiques dealer. She was past president of the Valley of the Sun Antique Dealer Assn. She became an expert in her specialty; antique stripped pine furniture and accessories. She was an excellent piano player and gave lessons from the age of 15 into her 60’s. She was also an excellent guitar player; she played with various groups in the valley in the 1960’s. She will also be missed by her many students. Visitation is Sunday, July 3 6-8 PM at Bunker’s Garden Chapel, 33 N. Centennial Way in Mesa and one hour before the services. Funeral services are Monday, July 4, 2011 at 11 AM at the Mesa East Stake Center, 2222 E. Brown Rd., Mesa. Burial will be Tuesday, July 5, 2011 at 10 AM at the City of Mesa Cemetery. Donations may be made to Hospice of the Valley or and LDS charity of your choice.